Marvin “Smitty” Smith affirms his wife of three years’ claim that he can lounge in the oversized leather chair for hours watching shows on his 32-inch Sony monitor. For big sporting events, however, such as fights and playoffs, the Tonight Show With Jay Leno drummer since 1995 has buddies over for viewing on his 100-inch projection TV. However, his wife’s cooking is the real reason they all flock to his Northridge Hills, Calif., 4,000-square-foot, two-story megapad that’s part of a securely gated development. “‘Is Kim going to cook her wings? '” chuckles Smith. “That’s the first thing they ask when I invite them over. She can bake, too, and cooked a pecan pie for one of my buddies. He couldn’t wait to get it home and was eating it in his car,” the drummer says, busting up. Before moving to California, the Waukegan, Ill.-native Smith lived in New York for 15 years. While in the Apple he worked with Jon Hendricks, Bobby Watson, Slide Hampton, Archie Shepp and many others including Kevin Eubanks, the current Tonight Show bandleader. When the Leno show offer came up, Smith wondered if could adjust to a different way of living. 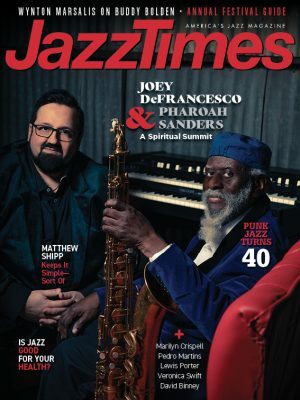 “Guys that had been out here before, such as Gary Bartz and Steve Turre, who grew up in the Bay Area, warned me. They said, ‘It’s not the same, and you’re not going to get the same kind of energy that you got in New York. A few years later, Smith started relaxing some, and he began to savor his great situation. Studio project and sideman gigs with Vanessa Rubin, Steve Turre, Carla Cook, Cedar Walton and Billy Childs also eased his restlessness. Composer-arranger-pianist Childs was a big influence on Smith, and as a result the drummer began collecting recording equipment and instruments to begin working on his composing and arranging skills. 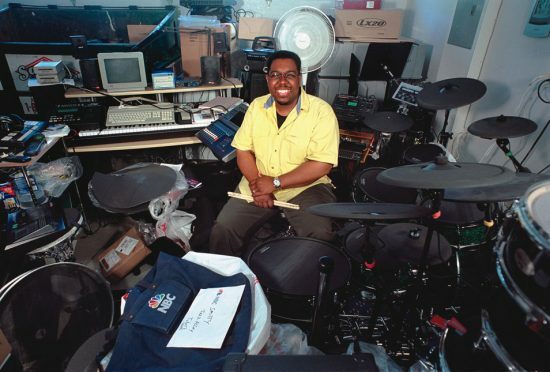 Two thirds of Smith’s three-car garage is overrun with gear, including a Yamaha workstation and a Pintech electronic drum set, which he endorses. Before Smith can seriously compose, however, he’ll need to get things organized, similar to his wife’s third of the garage, which houses some of her gift-basket-business supplies. Kim urges Marvin to be creative and noncomplacent and to toss any unnecessary gear. He shrugs and relates that it is hard for him to part with stuff. About a year ago the Smiths cohabited a townhouse in Sherman Oaks that was a third of the size of their present home but much closer to NBC’s Burbank studios. Kim has a large family, wants kids and is very social, so the larger home is more convenient for entertaining. And the abundance of space, the sweeping view of Los Angeles’ San Fernando Valley and close proximity to his wife’s shop greatly outweighs Smith’s additional commuting. “I like mystery shows like Matlock, Diagnosis Murder, Law & Order, CSI and The Wire, which one of my buddies, Wendell Pierce, is on. “I don’t go on them that much, because we only get a week off, about every 10 weeks. But last year in August, for two weeks, we went to New Zealand and Australia, and that was incredible. Kim always wants to do trips to Palm Springs, San Diego and Santa Barbara.